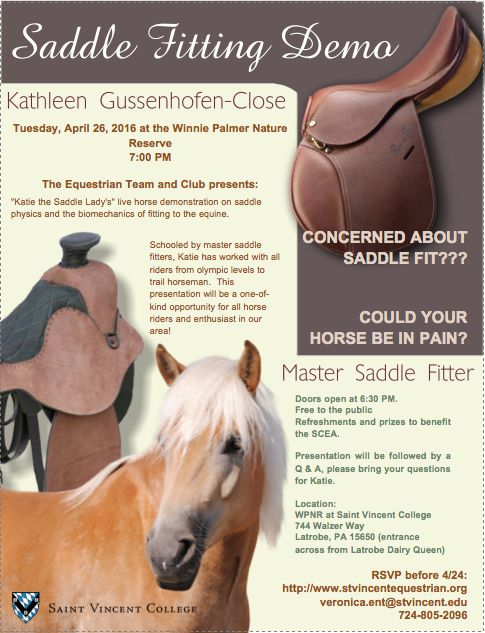 Who is "Katie the Saddle Lady"? Before becoming a full time saddlefitter I earned a degree from Penn State in Horticulture and then became a CPA and worked in the medical field in management for 20 years. As I am approaching my 59th birthday, I feel as if I should let you know how I supported myself, children and riding habits prior to saddlefitting. I am an event rider, so in 1998 I was in Kentucky as a spectator at Rolex and I met a saddle maker and watched him take a saddle apart and talk about fitting. I was hooked! About a year later I started reflocking saddles for Bruce Close. This entails taking English saddles part, replacing the old wool with new and re-assembling them. During this period I also took an equine massage course which reinforced a lot of the effect of saddle fit on the equine biomechanics. In 2003 I joined the sales force of County Saddles. I worked for them until June of 2013, balancing and selling saddles as well as training new agents. I've had the opportunity to work with numerous Olympic riders, Para Olympians, and the general riding public. I particularly I enjoy biomechanically challenging horses and problem solving so I've left sales and in the last several years focused primarily on fitting. I find I have more options for horses and riders not being bound to a brand. I've fitted ponies, mules and horses in saddles for jumping, dressage, fox hunting, and endurance riding for able bodied and disabled riders. I love what I do because I can help people and horses communicate more effectively for safer, healthier, more productive relationships. Entrance is across from the Latrobe Dairy Queen on Rt. 981.